THIS GIVEAWAY IS CLOSED! THE WINNER IS #7 - Ally M123. Congrats! YAY! I'm back to participate in another Read Aloud Thursday which Amy faithfully hosts on a weekly basis over at Hope is in the Word. Are you playing yet? Why not? This is a fun carnival if you are a mother of small children. I enjoy reading what Amy and the others find to read and share with their kids every week. It affords the opportunity to collect new ideas, as well as network a little. I'm looking forward to seeing what people have recommend this week. As for ourselves, we've been spending time with a curious little monkey named George. Jonathan took some time off of work this week so that we could have a little "mini vacation" as a family. I've been trying to think of fun things close to home that we can do and enjoy with one another. One thing that we thought we'd do this week is go to the Zoo which is about an hour and a half away from us. (I've been waiting to go to the Zoo for awhile now. Finally the weather is cooperating!) However, then we all got sick and there went that idea! Instead, we watched a rhinoceros video online and read Curious George Visits the Zoo . (It's as close as we got to the zoo THIS time but I still hold out hope!) 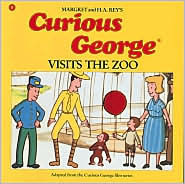 My two year old son enjoys Curious George and enjoys the Zoo so this book was a good combination. It's been awhile since we've even looked at our CG books but they were fun to delve into this week. I also thought it would be fun to make fun dinners this week and eat them outside. We have a nice patio that wraps around our house and since the weather is being extremely accommodating, we decided we'd make personal pizzas one night this week and eat them outside. That said, we read Curious George and the Pizza in conjunction with this activity. (Then it rained and so we moved inside and watched Pirates Who Don't Do Anything (Are you laughing yet? The best laid plans . . . seemed to not work this week.) Still, Bookworm1 really enjoyed eating all the olives in the can making his own pizza and devouring it. We'll have to try some fun family outings and activities later, apparently. But back to George . . . Curious George is frequently a little too curious and rather too disobedient for me to some extent. I mean, come on, he's a monkey! So long as my son focuses on that part and gets some laughs out of him, I'm good. But if he ever gets it into his head that it's funny to run away from mommy and get into mischief, I might rethink CG. Again, so far we're good. We're enjoying him. But we don't want to enjoy him alone, oh no! We have a little present to give away to one of this site's readers. We'd like to celebrate Curious George, the onset of summer, and the fact that we're back participating in Read Aloud Thursday with you! What's the prize? 1. 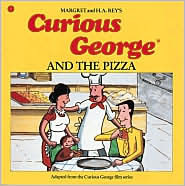 A Curious George activity book. There are over 500 pages to color and play on. Stickers and a poster are included. This is one hefty activity book and should keep the little ones occupied for some time! This is just a little way of celebrating summer and its my way of saying thanks for being a Reading to Know reader. 1. Must be a U.S. Resident. 2. Leave a comment below. Make sure to leave a valid e-mail address for me to contact you at. 4. Subscribe to Reading to Know and you can leave an extra comment for another chance to win. Or just leave one comment. It's as simple as that. Contest closes on Saturday, June 13th. Go forth, have fun, enjoy your summer, and don't forget to spend some time during these next few hot months reading! I'm heading off to blog your giveaway! We love CG too. Right now my daughter is in love with a Christmas CG book, so we are having snow and Christmas trees in June:) (No need to enter me in the contest, our CG stuffy may not like sharing the love). We love CG! We have a very loved large volume of CG stories. We love Curious George! Everything about him is fun! What a great giveaway! Thanks for the chance. I teach kindergarten. This would be great. My guys enjoy George but I'm like you - he's a little to full of mischief without appropriate consequences. What a fun giveaway! My children would love to have this! We watch Curious George every weekday morning on PBS and would love a book (and the stuffie is adorable!). :-) Thanks for the great giveaway! my 2 and 4 yr old loves CG. We watch it everyday during the week before we leave for daycare. My grandson loves Curious George. I must buy him a couple of books. Here's my email: shaneen at easilink dot com. We love CG, too -- my son's birthday party last year was CG! Thanks for the chance. 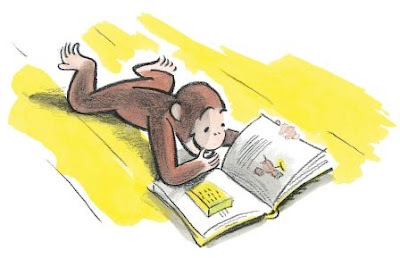 Oh Curious George is the epitome of cute! We love George! Thanks for the chance to win him! I have loved reading Curious George books since I was a child. My children now love them, too! I love that each time we go to the library, there seems to be another one that we haven't read yet! I subscribe & love your blog! My daughter loves Curious George! I loved him, too, as a child. We've read most of the Curious George books, but I've never seen the activity books or the plush!!! Those would be great.